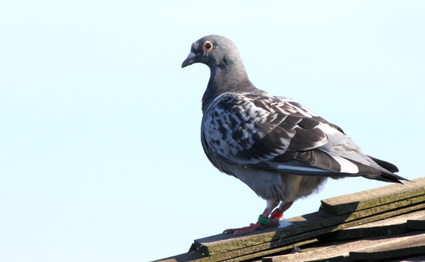 We thought this guy was one attractive pigeon when we photographed him with a telephoto lens late yesterday afternoon. When we looked at the photo closely (see below), we realize d he was a real thoroughbred — a racing pigeon or a show pigeon. He was seen atop the pavilion at the Meadowlands Environment Center. If you can tell us more, please do!